Wonder Woman is a superhero who places a lot of importance on her weapons. This makes plenty of sense since she needs her weaponry to defeat bad guys like Ares. Diana won't leave the house without her golden lasso of truth, unbreakable silver bracelets, and razor-sharp tiara for good reason: Ares is on the warpath. And your little Wonder Woman fan at home won't leave the house to collect candy without a very necessary item: a trick-or-treat pale. Luckily, the Wonder Woman Plastic Trick or Treat Bucket is here to save the day and vanquish your little one's Halloween worries. It's the easiest and safest way to protect your Halloween spoils! The Wonder Woman Plastic Trick or Treat Bucket is an officially licensed Wonder Woman item. It's constructed from molded plastic in the shape of the iconic Wonder Woman logo with a flexible plastic handle, measuring approximately 5-inches tall which means it can hold a lot of miniaturized candy! 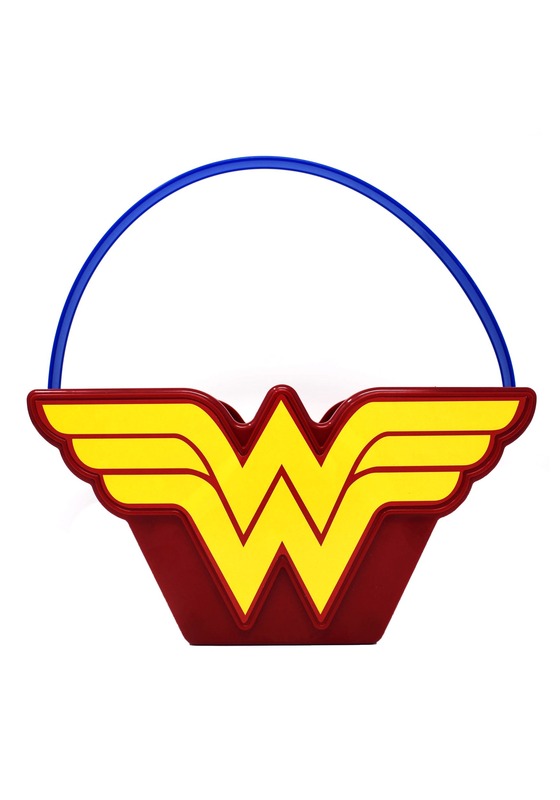 This handy-dandy treat bucket is a great way to offset any kid's Wonder Woman costume. Girls will love carrying a candy pale that matches their costume to a tee.